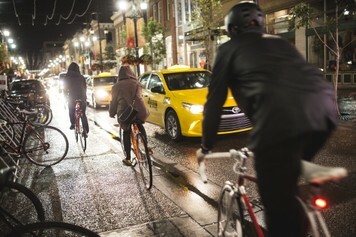 Riding bikes is fun and, without a doubt, the best way to get around Sled Island. Check out our venues page for details on bike parking availability. Our friends at Prohab Helmet Society ride with us each year and work to keep your noggins safe by selling helmets at wallet-friendly prices. If you don’t have a helmet, or if you’re looking for a new one, check them out. Need a rental? The good people at NOMAD Mobile Gear Rental have an awesome line of bikes available for hassle-free rental. Just order online and they'll deliver to your door at no additional charge. Pick-up at the end of your rental is also included. Finally, biking in Calgary is now easier and safer than ever. New cycle tracks are open on 5th St. SW (3rd Ave. SW to 17th Ave. SW), 12th Ave. (11th St. SW to 4th St. SE), 8th Ave. SW. (11th St. SW to Macleod Trail, excluding Stephen Ave.) and 9th Ave. SE (Macleod Trail to 4th St. SE). The tracks are part of a one-year pilot project and are segregated from vehicle traffic with barriers to keep you safe! Check out The City of Calgary’s pathways and bikeways map for details. Public transit is a convenient way to connect with venues and access neighbourhoods around Calgary. Buses and the CTrain cost $3.15 per trip and transfers last for 90 minutes. Using the train in the downtown core is free of charge. For information on routes, schedules and rates, visit Calgary Transit. Keep it simple! Sled Island is easy to experience on foot, with the majority of venues located in a 10- to 12-block radius.